Dr. Nirmalya Kumar is Lee Kong Chian Professor of Marketing at Singapore Management University and Distinguished Fellow at INSEAD Emerging Markets Institute. Prior to this, heading strategy as Member-Group Executive Council at Tata Sons, he reported to Cyrus Mistry, the Chairman for the $100 billion Tata group with 675,000 employees worldwide. 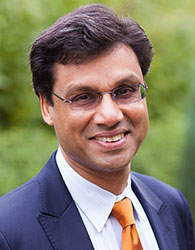 Professor Kumar previously taught at Columbia University, Harvard Business School, IMD (Switzerland), London Business School, and Northwestern University (Kellogg School of Management). As a consultant and speaker, Nirmalya has worked with over 50 Fortune 500 companies in 60 different countries. He has served on many boards of directors including ACC, Ambuja Cement, Bata India, Tata Chemicals, Ultratech, and Zensar, each with billion dollars plus in capitalization. As an author, Nirmalya has written eight books, the latest being Thinking Smart. His publications in leading academic journals as well as nine appearances in Harvard Business Review have attracted almost 20,000 Google Scholar citations. A prolific case writer; he has won six Case Centre adoption awards and the Outstanding Contribution to the Case Method. Nirmalya is considered one of the world’s leading thinkers on strategy and marketing. He was thrice included in Thinkers50 (the biannual listing of the top 50 management thinkers in the world), received their “Global Village Award” for his contributions to the business community's understanding of globalization and emerging markets, and was inducted into their Hall of Fame in 2017. He has also appeared on the 50 Best BSchool professors in the world (Poets & Quants) and 50 most influential Business School professors (mbarankings.com). Passionate about art, Nirmalya supports various museum exhibitions and publications through his art collection and served on the South Asian Acquisition Committee of Tate Modern. In recognition of his patronage and promotion of South Asian Art, he was awarded an Honorary Fellowship by the School of Oriental and African Studies (SOAS), University of London.